Israel's current president gives us a dramatic and revelatory biography of Israel's founding father and first prime minister. Shimon Peres was in his early twenties when he first met David Ben-Gurion. Although the state that Ben-Gurion would lead through war and peace had not yet declared its precarious independence, the 'Old Man', as he was called even then, was already a mythic figure. Peres, who came of age in the cabinets of Ben-Gurion, is uniquely placed to evoke this figure of stirring contradictions'a prophetic visionary and a canny pragmatist who early grasped the necessity of compromise for national survival. 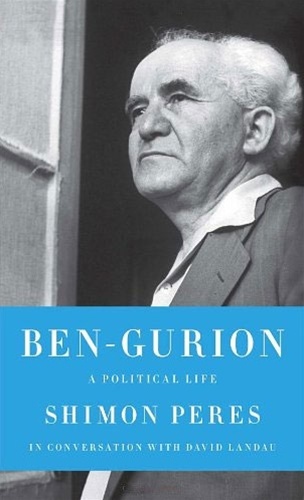 Ben-Gurion supported the 1947 United Nations Partition Plan for Palestine, though it meant surrendering a two-thousand-year-old dream of Jewish settlement in the entire land of Israel. He granted the Orthodox their first exemptions from military service despite his own deep secular commitments, and he reached out to Germany in the aftermath of the Holocaust, knowing that Israel would need as many strong alliances as possible within the European community. A protégé of Ben-Gurion and himself a legendary figure on the international political stage, Shimon Peres brings to his account of Ben-Gurion's life and towering achievements the profound insight of a statesman who shares Ben-Gurion?s dream of a modern, democratic Jewish nation-state that lives in peace and security alongside its Arab neighbors. In Ben-Gurion, Peres sees a neglected model of leadership that Israel and the world desperately need in the twenty-first century.